After spending some time in our Bendigo office, each Ag Achiever relocates to a regional office for the opportunity to work closely with the local agribusiness lenders. I’ve been based in Shepparton, part of the eastern region, for this rotation and would like to give you a flavour of what work in the regional office is like. During my time in Shepparton, I’ve been working closely with one of our specialist agribusiness lenders, known as an Agribusiness Relationship Manager (ARM) due to the importance of maintaining strong relationships with our clients. We get out on farm a number of times per week to meet with the client in person and build on the business relationship. While on farm, we often discuss what the client has been doing, what their business goals are and what they require to achieve these goals. This is usually a kitchen table chat and has an informal feel. There are always lots of questions from both parties, which gives us a great insight into the client’s business as well as local issues and market trends. People are usually very happy to showcase their farm, to let us see how they’re developing it, utilising technology and advancing their business. We use the information gathered from the interview to prepare any finance deal back in the office, including our valuation of the farm. Something I really enjoy about the role is that every farm visit is an exciting experience, with no two visits the same. The photos below show a land auction I attended last month, and a farm visit with a client who grows irrigated Lucerne and other crops in conjunction with their dairy enterprise. 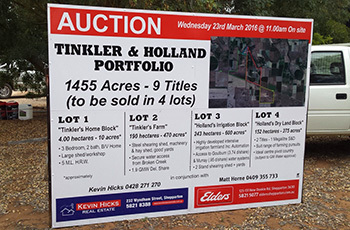 Auctions are a particularly good opportunity to meet locals and auctioneers who work in the area, while also getting a feel for the value of the region’s land. I have been working on deals with the ARM up until now and I hope to undertake a client visit on my own as I am approaching the last few months of the program. This photo was taken when I visited a dairy farm in the south west of Victoria during my rotation in Rural Finance’s Warrnambool office. We were given a tour of the dairy as the last of the cows left the yards from the morning milking. The property owners were preparing the dairy for a changeover of milk contracts. As part of the farm visit, we also discussed their need to replace and upgrade an old tractor. This involved changing model and increasing the horsepower of the machine to increase its useability as the main tractor for the farm. This new piece of machinery would be used to sow and spread fertiliser around the farm. Hello, I’m David Swain and welcome to the Rural Finance and Rural Bank Graduate blog. I will be writing here to update you on what I have been doing within the Graduate program here and how it might be appropriate for you, if you apply in this year’s intake. A bit about me – I studied a Bachelor of Agriculture at the University of Melbourne and completed my final year at Dookie College. I joined the Graduate Program to gain experience in agribusiness lending, with my ambition being to become an Agribusiness Relationship Manager, supporting farmers to help their businesses succeed. I am currently in the last six months of the 18-month program and have been lucky to live and work in three different locations. I spent six months in Bendigo learning the mechanics of the business before undertaking six months in Warrnambool learning the role of the regional Relationship Management team. I am now in Shepparton learning more “tricks of the trade”. It’s been great to gain a real-life understanding of how finance works for customers and also the role of the service provider in that relationship. Whilst in the Bendigo office, I was given a number of opportunities to work with the Bank’s Executive team to develop future ideas and tools to support the business. These projects were undertaken with other graduates from my intake and we were given the opportunity to present our completed work to the Rural Bank Board, senior leaders and other staff to showcase its relevance to the everyday operation of the business. I have really enjoyed traveling to meet new and existing clients, developing the relationship, and assisting these farmers achieve their ambitions. Every day brings something new and it’s a great working environment with a good balance of time spent in the office and out on the road. My favourite part of the job is getting on farm and talking with clients to help them grow their business and achieve their goals.